Full Disclosure: Patrick Smacchia (lead dev of NDepend) offered me an NDepend Professional license so that I could use it and blog about it. I gladly received it. Now I’m going to tell you how much it rocks, but not because I have to. I had been having interest in NDepend for quite some time. It’s a great tool in promoting good application code and architecture, something I’m quite fond of. This is a tool that I would have been using anyway if the project I’m working on were on .Net. 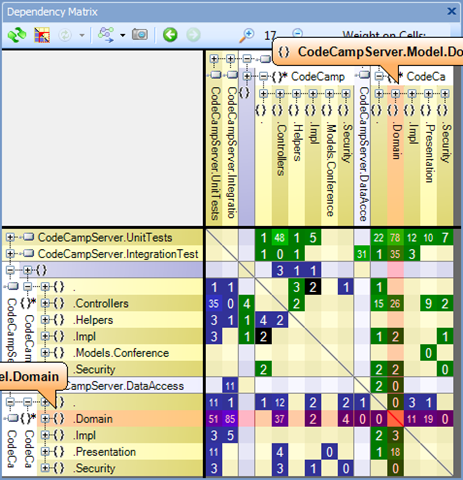 In case you haven’t been within the reach of geeky hype signal recently and never heard about NDepend, it is a tool that reads into your source code, and statically analyses if the code meets certain design guidelines and quality. By “statically”, it means that it examines your code without actually running it. NDepend is often used in code-review process during development to easily identify spots in the code that could be improved. FxCop works on fine-grain details. It inspects each line of instruction or coding structure, and how they comply with framework design guideline. NDepend works more from high-level application architecture viewpoint. It visualizes the code in terms of dependencies, complexities, and other design metrics in quantifiable numbers, giving you a big picture idea of the state of the code and spot smelly areas. 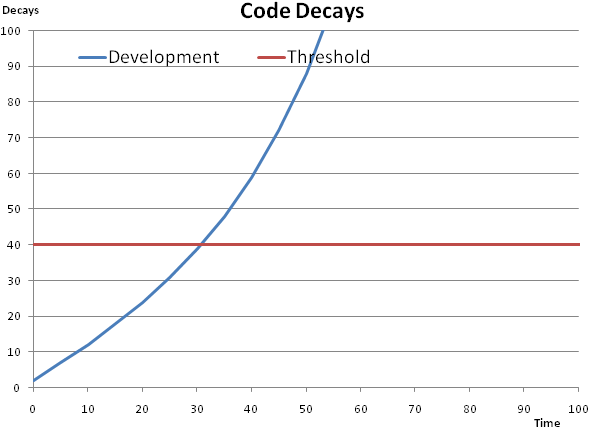 You can then define some thresholds to define an acceptable level of code quality. Further down this post, this difference will become crystal clear. FxCop gives you a set of rules you can use, but and there is no easy way to express your own rule. Adding new rule involves writing new add-in to be plugged into FxCop. The primary strength of NDepend is on its CQL (Code Query Language), a DSL that allows you to express your own custom rule and evaluate it on the fly as you type. NDepend makes me wish my current project at work was written on C#. It is in fact written in Java. Incidentally, developed using big-ball-of-mud approach, the code has degraded to one of the worst source-codes I have worked on. That should have been absolutely the perfect place to use NDepend and refactor the big mess out loud. Alas NDepend doesn’t deal with Java. 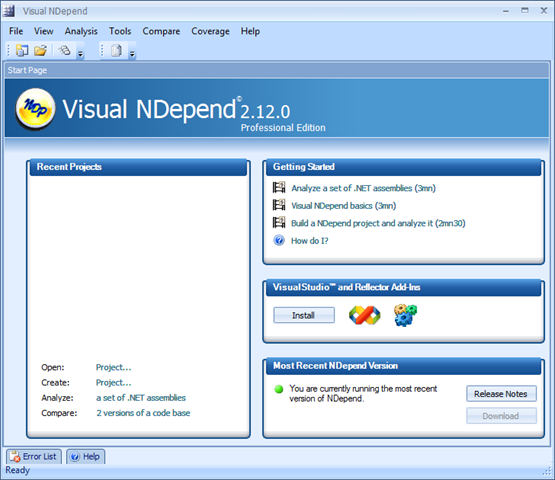 The good news is, NDepend just announced to release NDepend for Java, XDepend. But that’s for another post. For our purpose, I pick a codebase from one of open-source .net projects I am quite familiar with, CodeCampServer, a web application developed using a Domain-Driven-Design and Test-Driven-Development on MVC platform. That perfectly mimics my idea of good application architecture. 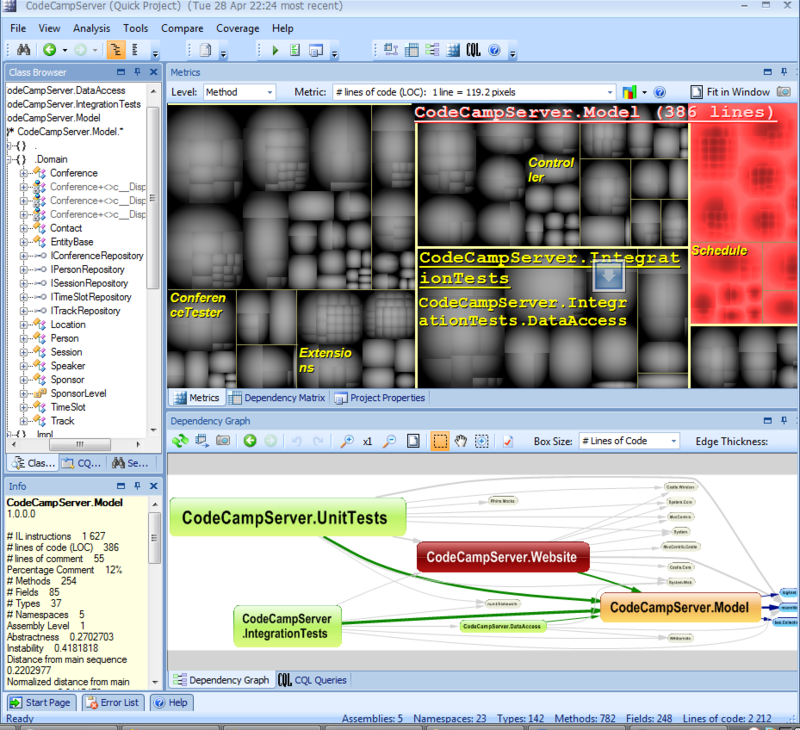 UI appearance of Visual NDepend very much feels like Visual Studio environment. Getting NDepend to analyse assemblies is incredibly easy! Literally couple of intuitive clicks, and before I know it, I am presented with fantastic details of information about the project. Dependency graph is the best way to understand the architecture of the code. You can navigate further deeper to get more intimate understanding about the code. Since CodeCampServer is built using Domain-Driven-Design, the domain-model layer is more than likely to be our primary interest in understanding the application, particularly when it’s developed by other people. What we are looking at is a direct x-ray scan of CodeCampServer.Model.Domain namespace, and it says 1 thing: the code is impressive! Doesn’t take much to notice that CodeCampServer is developed using a solid Domain-Driven-Design: the code almost looks like business document. None of all classes within this namespace has any reference to some geeky technical details or infrastructure components. Indeed, the dependency graph of this code directly reflects the business models and their associations, which is readily consumable not only for developers, but also for business people. Big A+ for CodeCampServer. Dependency graph can also be presented in the form of matrix. So back to the previous complete matrix, it shows that CodeCampServer.Model.Domain namespace does not have any reference to any other namespace (all horizontal boxes are blue). To put in other word, domain-model is the core of this application (see Onion Architecture). All DDD-ish so far. What I find interesting is that data-access namespace (CodeCampServer.DataAccess) makes *zero* direct communication with CodeCampServer.Model.Domain. It means that none of the repositories makes a direct communication with domain entities at all. This is impressive! It might seem counter-intuitive at first, how can those repositories create instances of domain-entities from DB, as well as save the state of domain-entities to DB without making any communication with any method/property/constructor of domain entity? CodeCampServer uses NHibernate as ORM which completely decouples data-access concerns from the application code. Repositories in data-access layer simply delegate all CRUD operations of domain entities to NHibernate that will handle the creation and persistence of domain-entities. The repository itself makes totally zero direct communication with domain-entity. Overall, CodeCampServer has a very good dependency matrix, but you will be surprised of how many unexpected smells that you can find in your application. You might find many things are not written in the way how you architect it. 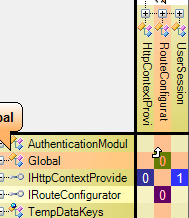 If one of your developers take a shortcut and, say, call security-checking from domain-entity, you will notice an unexpected reference from the dependency matrix (Domain->Security). You can even setup automatic alert when that happens, e.g. when domain layer has any reference to other namespace. More on that later. This is what we normally need to be alerted with. CodeCampServer.Website.Impl makes a circular reference with CodeCampServer.Website. A reference from CodeCampServer.Website into a member in more specific namespace like CodeCampServer.Website.Impl signals some kind of smell. You can navigate through the detail of the reference by clicking on the box. Turns out that CodeCampServer.Website.Globals make a reference to CodeCampServer.Website.Impl.RouteConfigurator. The reference is apparently caused by Windsor IoC configuration in Globals.RegisterMvcTypes() methods. 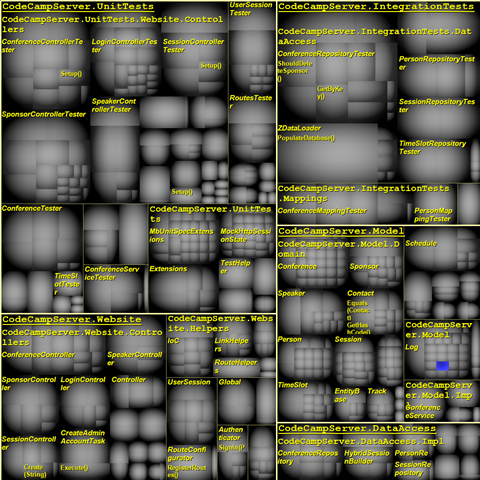 The black areas indicates that those namespaces are tightly entangled together. Tight coupling means that all those 6 namespaces can only be understood together, which adds complexity in understanding and maintaining the code. Of course tight-coupling also means that they all can only be used together. I.e. to use dependency-injection capability from Spring.Core, you will need the presence of Spring.Validation in the baggage. 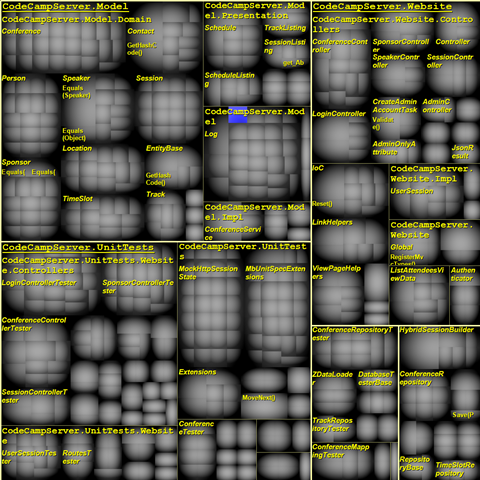 NDepend presents overview information about our code in various metric. For example, here is “Line of Code” metric for CodeCampServer. CodeCampServer is written with TDD, so unsurprisingly, Unit-Tests takes up majority of the code lines. Followed by integration-tests. The biggest portion of application-code is on Website layer. And here is my favorite part: just like a street map, you can zoom deeply into this map by scrolling your map, from top assembly level down to classes and individual methods! In fact, you can use your mouse scroll to zoom almost anything in NDepend user interface. Now let’s see the map for Cyclomatic Complexity metric. The more if/else/switch statements in your code, the higher Cyclomatic Complexity it gets. CodeCampServer is developed using Domain-Driven-Design approach, so when it comes to complexity and decision-making, Model layer takes up most of the space. Unit-test takes just about the same size. I can’t repeat this enough: CQL is brilliant! It gives you the power to gather just about any information you need about your source code. CQL is very similar to SQL, but instead of querying the database, you are querying into your source-code. You can use CQL to quickly search for particular areas in your code that can be of your interest in term of code quality. The information that you can query with CQL is comprehensive. NDepends provides a huge 82 code metrics that provides access to large range of information you need. Which methods have been refactored since last release and is not thoroughly covered by unit-tests? What public methods could be declared as private? So far we have been talking about all various statistics and analysis, but we haven’t seen the part that matters the most in a static analysis tool: code inspection. You can set up custom coding guidelines using CQS, and let NDepend regularly inspect your codebase to meet the project standard, and issue warnings when somebody violates the rule. Repository should not flush NHibernate session. It violates unit-of-work pattern. Methods that have too many parameters are smelly. Continuous quality is the ultimate goal of code-analysis tools. You can hook NDepend to your project’s continuous integration servers. Hooking NDepend to TeamCity allows it to continuously monitor the quality of the project based on design rules you specifies, and ring the alarm when somebody checks-in some malicious code that violates design guidelines of the house. This gives an immediate feedback to the developers to fix the code before it degrades the codebase. Yes, we “Fix” code NOT only when something is broken, but also when the code does not meet certain quality threshold! It’s often difficult to get that across to some people. This ensures not only that all codes being checked-in can actually be built into an actual application that satisfies all the requirements (unit-tests), but also ensures that the codebase continuously meet acceptable level of quality. At the start of the project, the code is looking good. Methods are short, classes are awesomely designed, loose coupling is maintained. Over time as the complexity grows, methods are getting stuffed up with if/else and non-sense code, classes are entangled together… The code starts to decay. When the code gets so bad and the heat goes beyond acceptable level or violates certain coding guidelines, NDepend starts complaining screaming for refactoring. The developers starts cleaning up their mess and refactor the code, while the code is still reasonably manageable. The heat cools down a bit, and quality is getting better. As the development progressing, the heat keeps jumping up and each time NDepend gives you immediate feedback, allowing you to refactor the code before it gets too difficult. 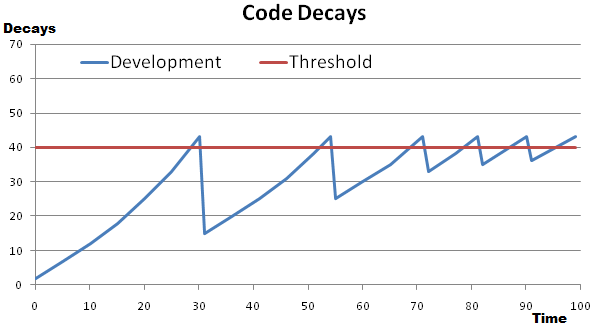 The overall code quality is constant over time. Stable or abstract do not mean anything bad or good about the code. That is just a fact about the code. 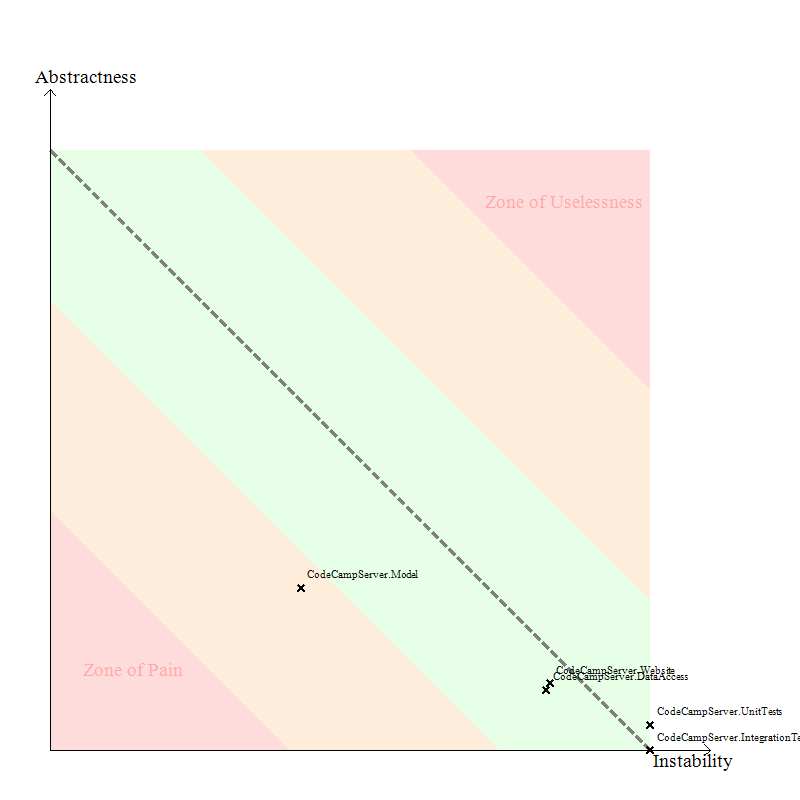 Abstractness indicates the ratio between interfaces, abstract classes, or sealed classes within the package. Abstract package gives more flexibility in changing the code. Useless: the package is used by no one, but it has a lot of abstractness, hence over-engineering. The website and data-access of CodeCampServer are infrastructure implementations, and it is structured that there is nothing in the application that depends on them. Thus they’re located at the edge of instability in the diagram. The core of the application, Model layer are by nature stable. They cannot be easily changed without affecting the other part of the application. Luckily it is highly decoupled (using service-interface and repository-interface), so it has higher abstraction, although not enough to make it into green area. There are however some area that NDepend still falls short. 82 metrics are impressive, added with CQL it makes NDepend far superior than other code-analysis tools in term of the easiness of customisation. However, I haven’t found any mean to actually extend the metrics (or the constraints). Even though FxCop’s customisability is very limited, it’s fairly easy to write your own plugin and extend the tool yourself. Having said that, NDepend is a really impressive tool. Lives for architects and application designers have never been easier. They no longer need to deal only with whiteboards and CASE tools. NDepend allows them to deal straight with the actual code realtime. Looking into the code from architectural viewpoint. NDepend provides great deal of flexibility with its brilliant CQL. NDepend is very intuitive, and it took me almost no time to get going and do interesting things. Previous PostAre You a Mockaholic?Next PostBig Is Beautiful.. Concerning the absence of any notion of subquery in CQl, this is an important point we will definitely improve within the next releases. Concerning integration with TeamCity: Have you read the following post? Please come back to me about the exact improvment you wish to haev. Glad to know that NDepend is improving its CQL! I think subquery is one single feature that would make NDepend totally godsend. I did read Laurent Kempe’s post (in fact I link it from this post). He shows how to loads up the HTML report on TeamCity page which allows us to see the report for individual build. I think what’s missing is tighter integration by feeding statistical data from NDepend into TeamCity’s custom chart integration. Thus TeamCity would allow us to see the trend/progression of the metric over time between the builds as a continuous line. (Just like code-coverage and code-duplication analysis presently, allowing us to follow when the metric suddenly drops/peaks, like the code-decay charts above). And also, integrating NDepend warnings to TeamCity’s alert. Not that I particularly need all those, but something I initially expected. So it would be interesting to know how to extract statistical data from NDepend so that we can reuse it for other purpose (e.g. TeamCity). Actually if you look in your NDepend project ‘DirOut’, you’ll see some xml files from which the report is built with XSL. You can parse this xml to get any information you need. Of course this is still requiring some extra-work and in the future, we have also plans to make all statistical or even fine-grained data extraction much much easier (but we cannot reveal too much for now).